I cannot say enough positive things about this brand. 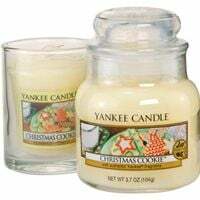 Yankee Candles are made in America, burn better than any other candle on the market, come in an incredible variety of scents, and are widely available. They are very well priced for the amount of burn time you get out of each candle and are by far my favorite candle company. This candle really does smell like Christmas Cookies! It has a strong ...read morevanilla undertone, but the sweetness is cut by a something that I can’t quite put my finger on. It isn’t clove, but it is some other spice. It evokes a warm feeling when burned and doesn’t get to be too overpowering if burned for a long time. This is also a great gender neutral candle – all my male friends adore this scent and I have given it away as gifts to both male and female friends. You really can’t go wrong with this scent! Yummy!!! I keep this in my kitchen so it smells like I have been baking. Yankee candles are really great. They smell nice and they last a long time. I don't really have anything negative to say about their products.